The Nelson Seed Library is currently accepting all types of seed, however it is important that seeds meet the following requirements. For more information on how to save the seeds please look at our seed saving pages. The seed saving aspect of Nelson Seed Library is what ensures a successful, regionally-adapted, and genetically diverse seed collection that is self-sustaining! ​Best seed saving practices should be followed where possible. We encourage all our members to learn more about how to save seeds and hope that you will be able to join us for one of our seed saving workshops. Here are some additional things to consider when saving seeds. Please try to collect as much seed as you can manage. This allows us to share the seed widely. The quantity will hopefully be of sufficient to provide seed to a minimum of 10 gardeners, depending on the type of plant this may be anywhere from 30 seeds upwards (considering a single lettuce plant may produce 30,000 seeds this is not normally a problem. If you can, please return enough seed to fill a jar! Hybrid seeds that have been purchased from a seed supplier can be dropped off to the seed library e.g half used packets. However seeds saved from hybrid plants should not be returned. To learn more, read our Hybrid information page. Drop your seeds in to the Library. Outside the Research Room there is a silver drum, this is where returns and donations are to be dropped off. 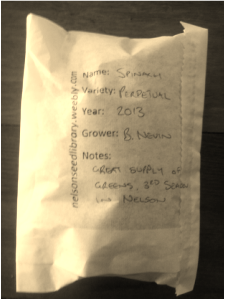 When labeling seed for donation to the Nelson Seed Library please include as much information as possible. This helps to keep track of varieties and of the stories attached to each seed line. Although not required, if you know the botanical/Latin name for your seed then please include it. If you don't know what the details are or suspect that the plant may not be true-to-type then either leave the variety blank or put "unknown" and put any further information in the Notes area e.g. "Self seeded random brassica, large leafs and crunchy stem, similar to Pak Choi" or "Sweet yellow pear shaped tomatoes, saved from Steve's garden in Motueka"